Iamba Elizabeth Mullens, a graduate of KCAD (Kendall School of Art & Design) is a dedicated and joyful stay-at-home mom for her two darling children, and a part-time fine art painter. She honors her family by signing her work “Iamba” which was her Grandmother’s name. 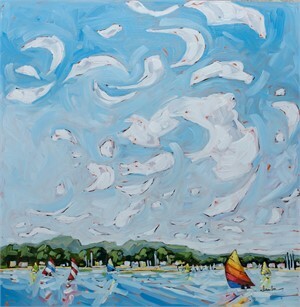 Liz resides in Grand Rapids and captures cloud filled skies over the bays in Lake Michigan and the nearby landscape with a unique brushstroke technique.